With iOS 11, users of iPhones and other Apple devices can now enjoy at-a-go many functions that hitherto required third-party apps. With just a swipe, you can open and switch apps instantly. As easy as counting A-B-C, you can customise it with nearly all your favourite apps. It also allows you to multitask easily as apps you‘ve opened recently and apps that are currently open on your iPhone or Mac appear in the right side of the Dock. You can open a second app right from the Dock, and both apps remain active in Slide Over as well as Split View. You can drag the second app in Slide Over to the left. And you can get back to your favorite App Spaces in the redesigned App Switcher. You can delete apps from the phone while still retaining stored data. This way, unused apps won't take up valuable storage space. Should you choose to reinstall an app, all of your personal data will still be available and restored. With the new iOS, taking and editing screenshots is now easier, as a preview of the screenshot is displayed directly after you press the key combination. Tapping on it allows you to edit it. Similarly, you can easily video and record things happening on the screen of your iPhones and iPads i.e. screencasts, using the onboard equipment. Like iCloud Drive, the new Files app will help you organize and access files across all your devices. But unlike iCloud, Files will allow users to access third-party apps such as Dropbox and Google Drive, local files, and cross-platform cloud storage in one easy-to-access app. A whole new world of functionality just opened up for those who want to be able to work and access important document from an iPad or iPhone. The iOS 11 is packed with extra photo filters and effects such as loops, bounces and long exposure times. The camera now has the capability to scan QR codes which eliminates the need to install potentially dubious third-party scanner-apps. If the camera is active, it automatically searches for QR codes and processes them without stress. This next-generation compression technology lets you take new photos with the same quality as before at half the file size. With the Control Centre, you can choose which quick shortcuts you want displayed on the screen of your Apple devices. 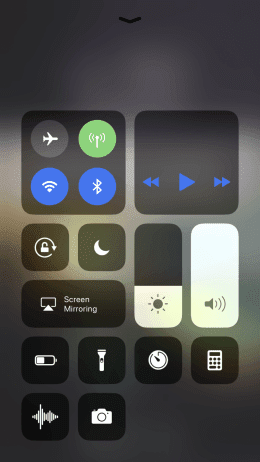 The Control Centre can also be used to disable unused buttons and customised based on what you prefer. The coolest new iOS 11 feature may be the ability to drag and drop items on the iPad. Images and files can be dragged from one app and dropped into another using Slive Over and Split View. Users can even drag and drop with two hands making this new iOS 11 feature a monumental leap in functionality. Apple Maps now has interactive multi-lane guidance that lets users know which lane they need to be in before they get to an intersection or exit. Additionally, Maps can tell users the speed limit on a particular stretch of road so they don't need to wonder if there are no signs posted. Venmo and other apps that allow peer-to-peer payments are becoming increasingly popular and Apple has finally taken notice. iOS 11 will allow users to make and request payments directly through Messages app. All transactions will need to be confirmed with Touch ID, making the whole process extra secure. Unlike the App store on previous versions, the latest iOS 11 has new categories, including a dedicated Games tab, tips and curated software collections that are designed to help users find apps easily. It also offers experts’ tips and tricks to make handling of individual apps a smart experience for users. According to Apple, the latest iOS 11 mobile operating system is compatible with iPhones 5S or above, iPads mini 2 or above and the iPod touch (sixth generation or above). You can easily download the update via iTunes by tapping on "Settings," then click on "General" and then "Software Update," or transferred to the device through a USB cable.